It was back in June 2014 when I first stepped into a mosque. 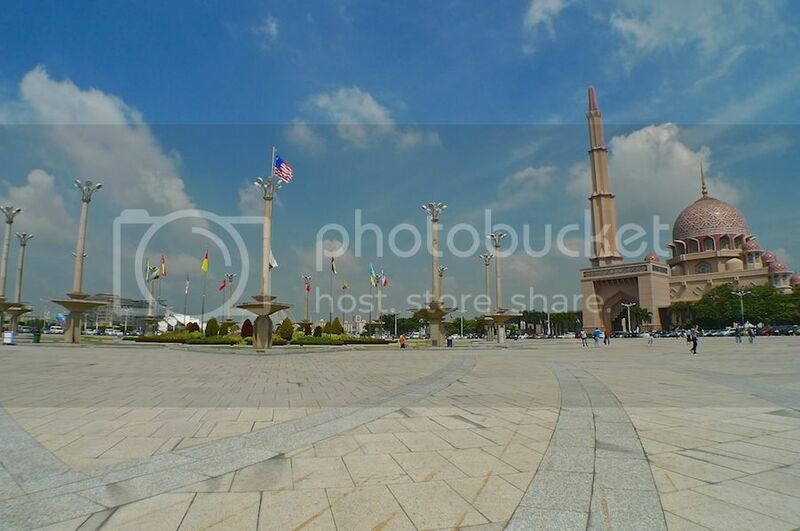 It was the Putra Mosque (also known as Masjid Putra) in Putrajaya. I am not a Muslim. 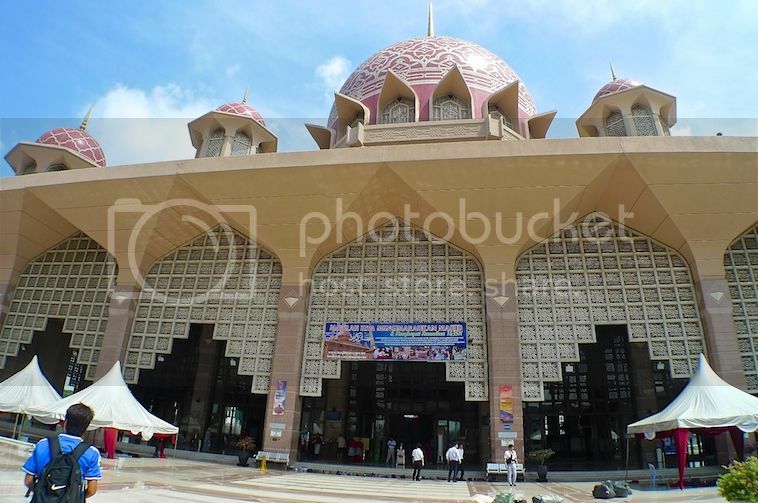 Was I allowed to enter a mosque here in Malaysia? The answer is yes and non Muslims are more than welcomed to visit a mosque as long as it is not during prayer times and you are decently dressed. 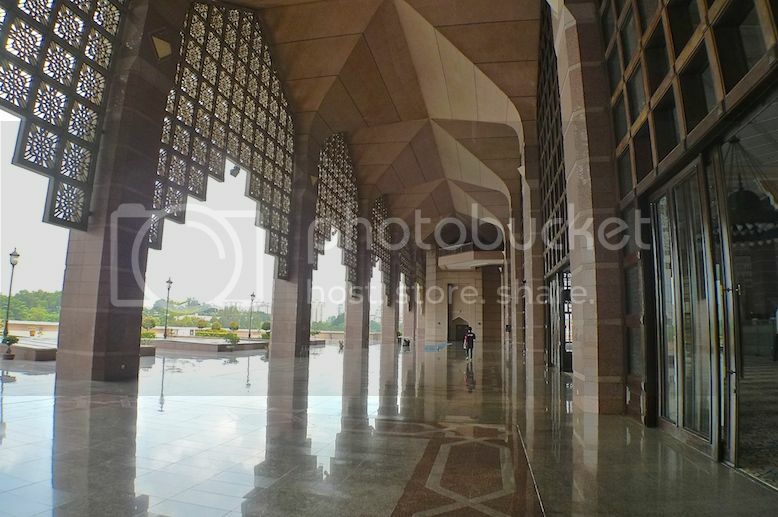 I was bringing a visiting Filipino friend on a tour of Putrajaya that day. We stopped by the Seri Wawasan Bridge to take photos. 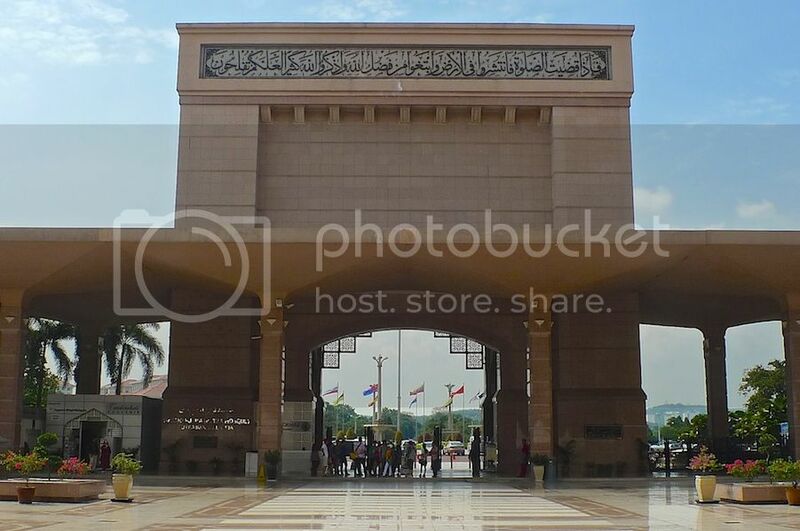 There are altogether 9 landmark bridges in Putrajaya. 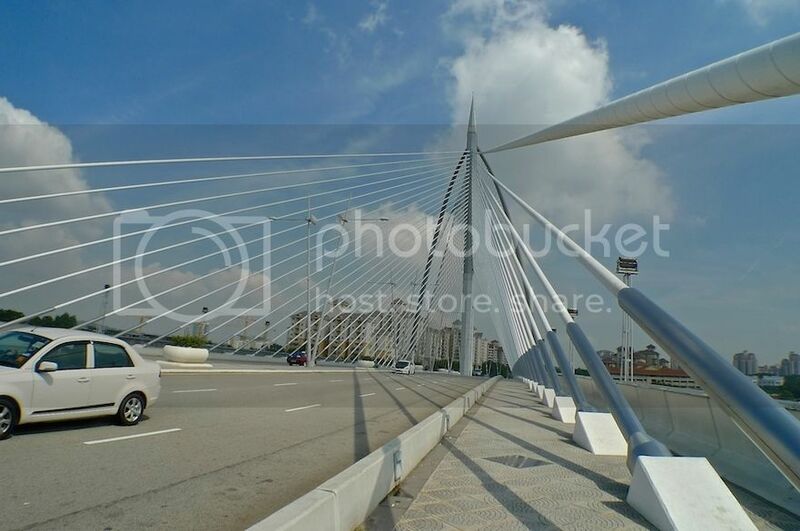 I have covered 6 of them on my blog and you can read about them (including the above bridge) and a brief introduction to the city of Putrajaya HERE. 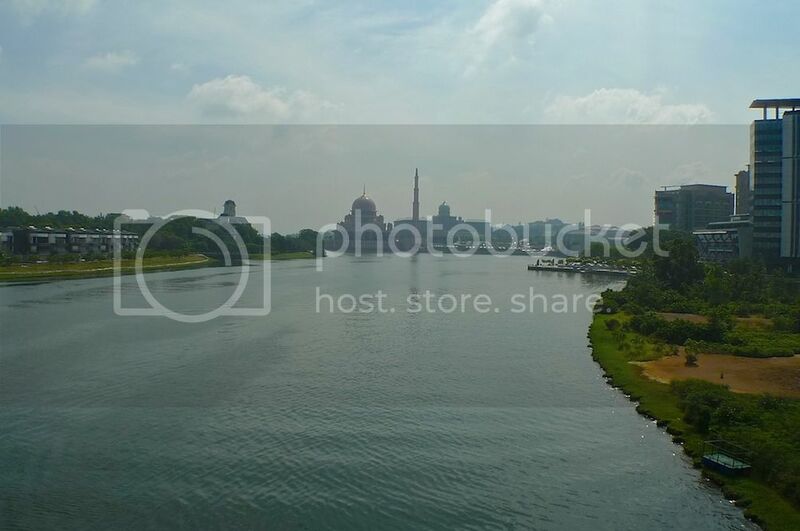 Standing on the bridge, we could see the Putra Mosque in the distance. Can you see the dome shaped building and the tall minaret beside it in the photo below? 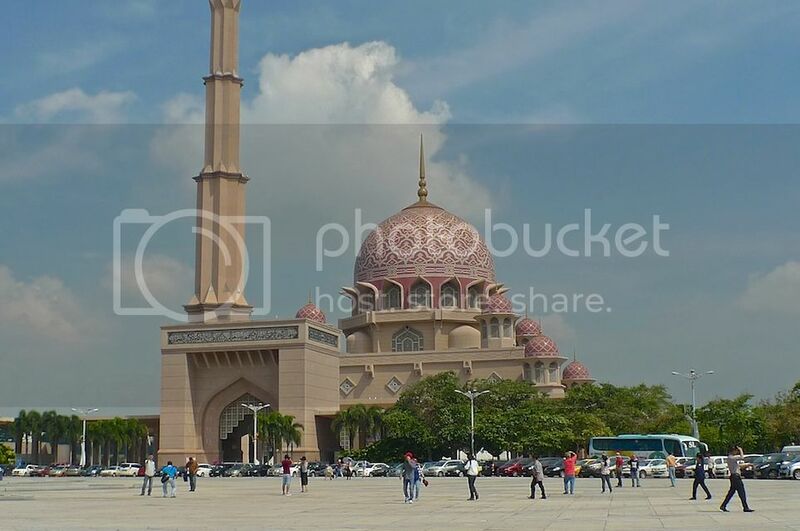 That's the Putra Mosque! 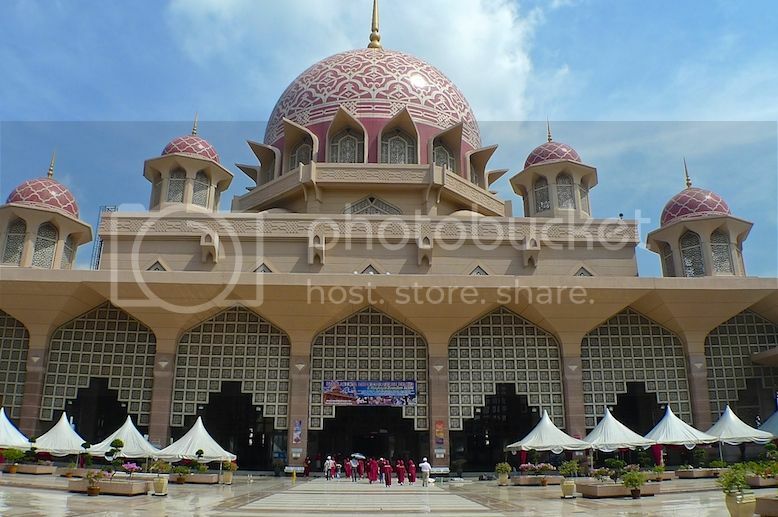 It was just a 5 minutes drive from the Seri Wawasan Bridge to the mosque. 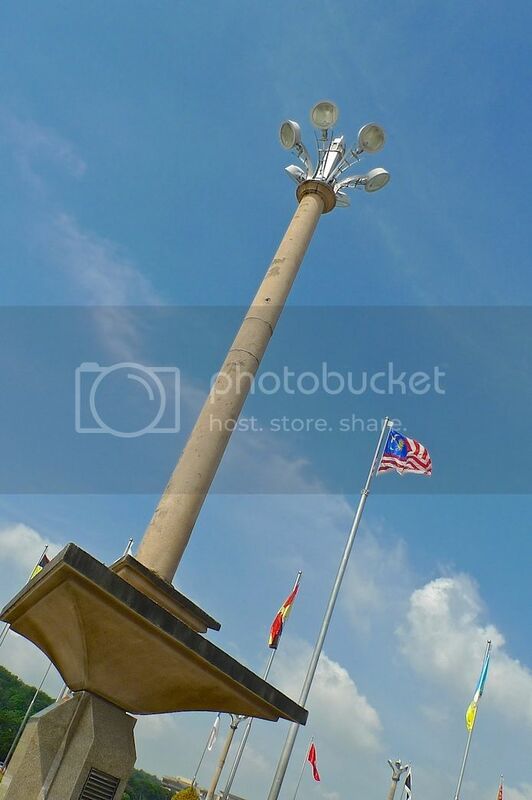 In front of the mosque is a large public square known as Dataran Putra with many flagpoles flying the Malaysian states' flags. 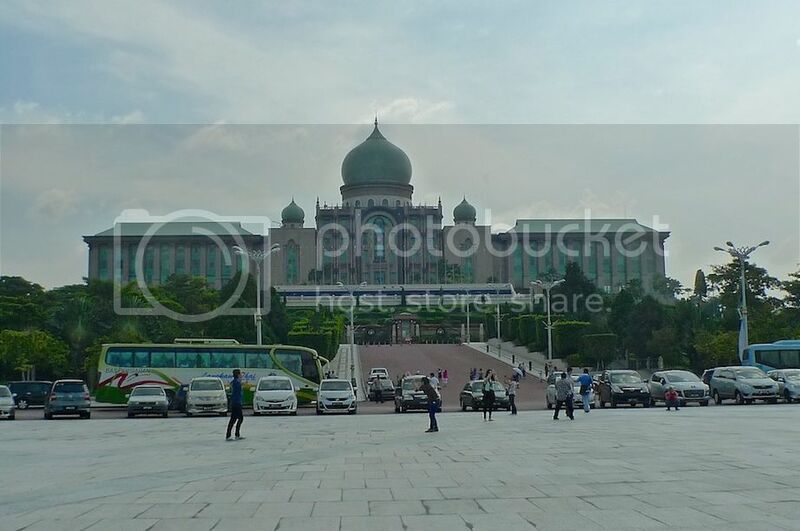 Located next to the mosque is Perdana Putra which houses the Malaysian Prime Minister's office. 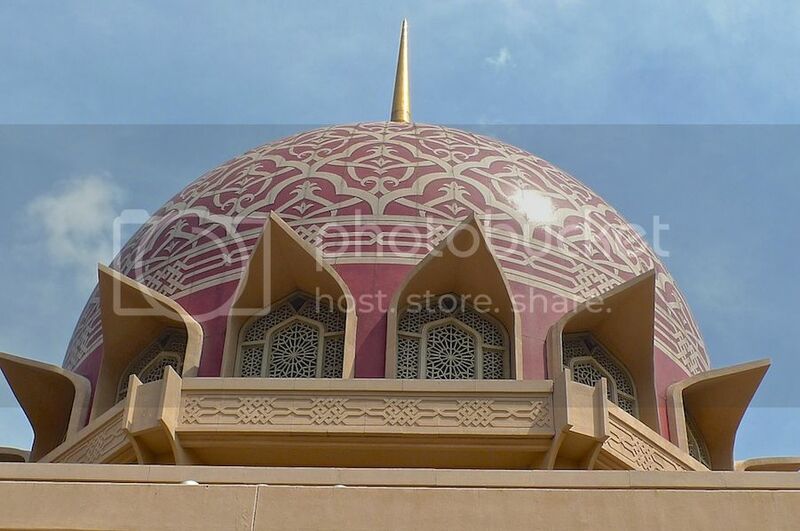 Construction of this pink-domed mosque began in 1997 and was completed in 1999. 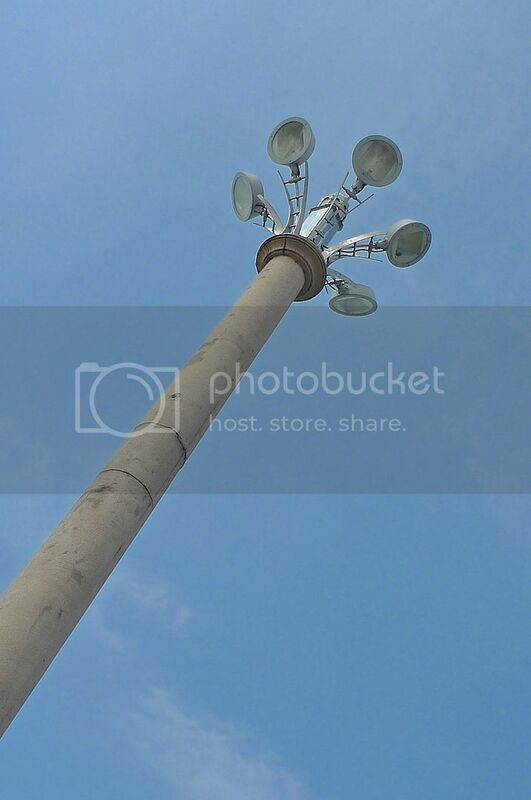 As we walked towards the mosque, I took some pictures of the tall lamp post at the square. 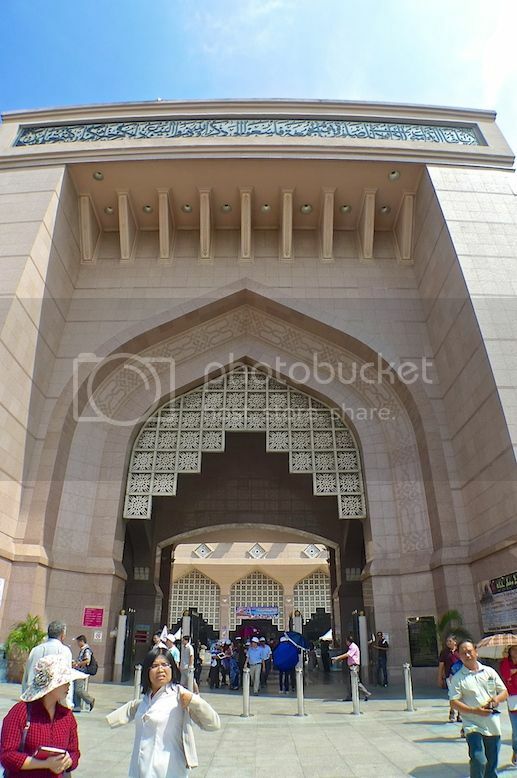 At the main entrance of Putra Mosque. There were some tourists there that day. 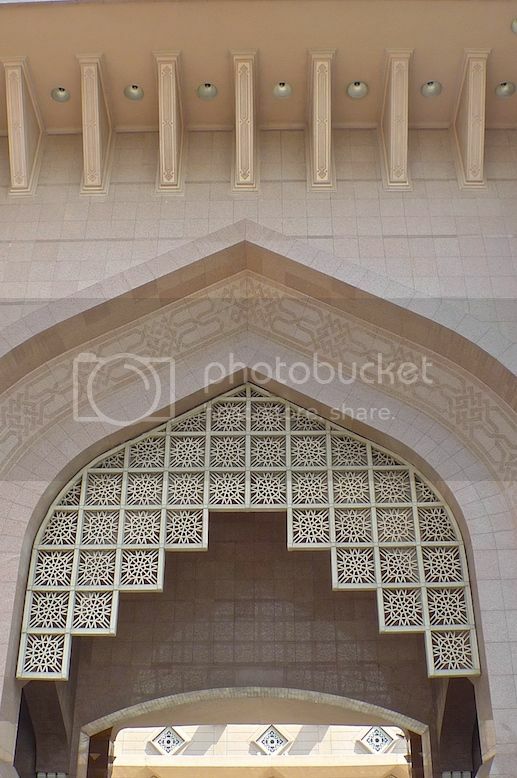 Look at the beautiful intricate design at the top of the arch-shaped entrance! 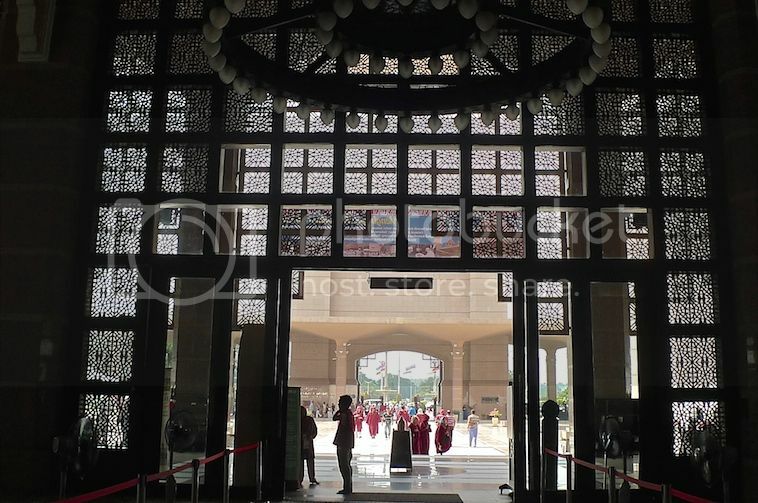 As we walked past the main entrance into the courtyard, the beautiful image of the Putra mosque came into view. 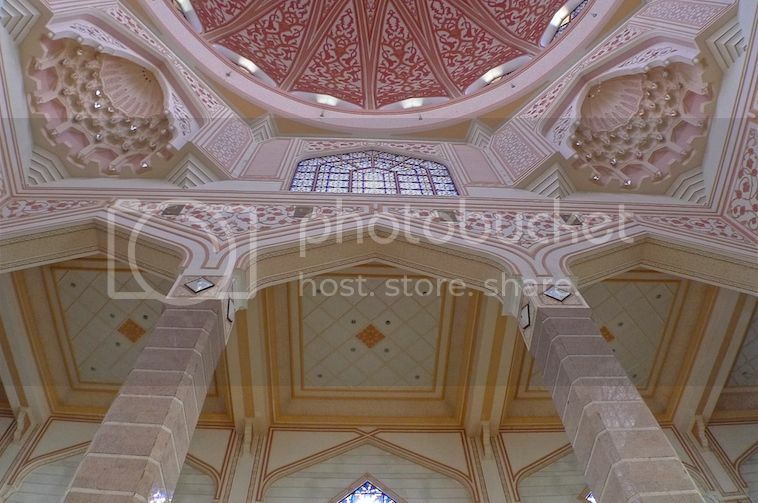 The mosque has an interesting mixture of Malaysian, Persian and Arab-Islamic architectural designs. The minaret is equally impressive. 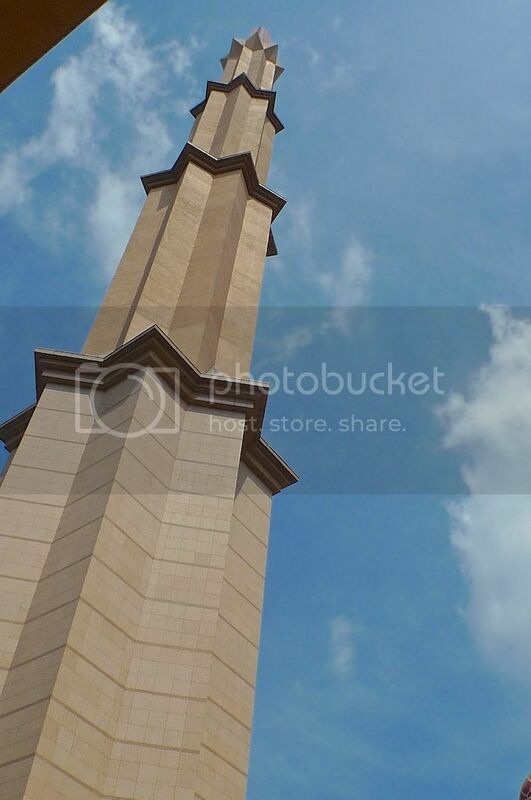 Influenced by the design of the Sheikh Omar Mosque in Baghdad, this 116 metre tall minaret has five tiers, representing the five pillars of Islam. 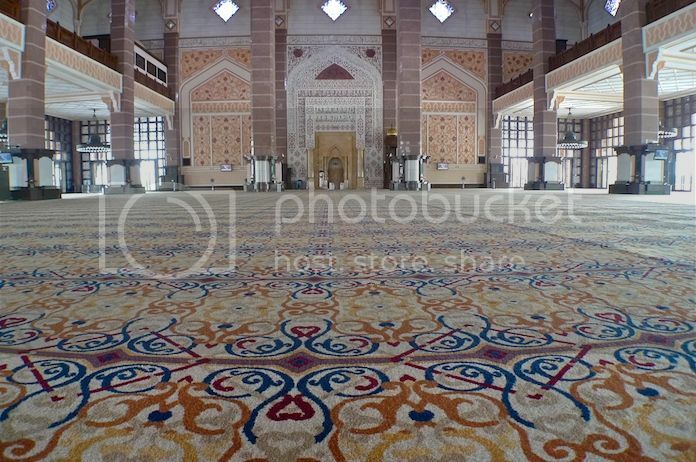 We spent some time taking pictures before entering the mosque. That's my Filipino friend in blue shirt admiring the mosque from near. 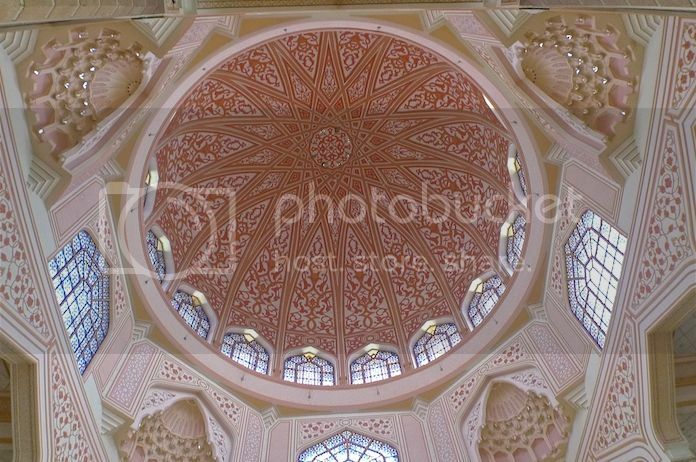 I love the pink domes of the mosque! They were built with rose-tinted granite which gave them the beautiful pinkish hue. This is the view from behind the main entrance. The mosque provides robes for those who are not suitably dressed. My friend and I did not have to put on the robes as our simple collared T-shirts and jeans were deemed acceptable. My first time stepping into a mosque. We left our shoes outside. There was a friendly guide who walked around showing us the interior of the mosque. 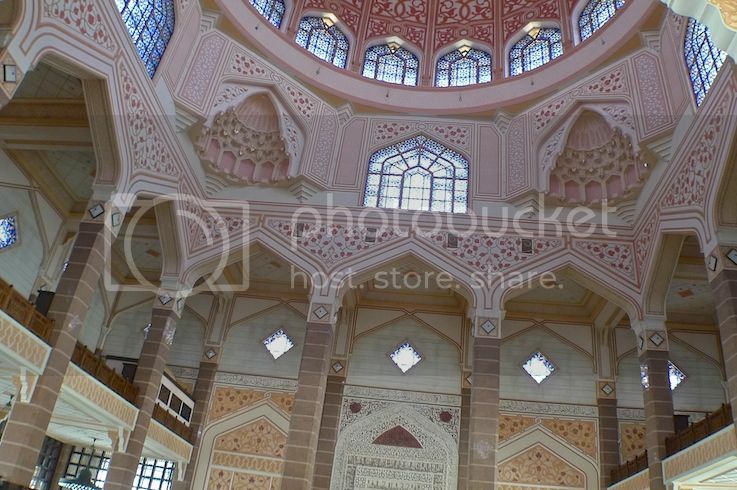 This is my favourite part of the mosque - the main dome. So beautiful! 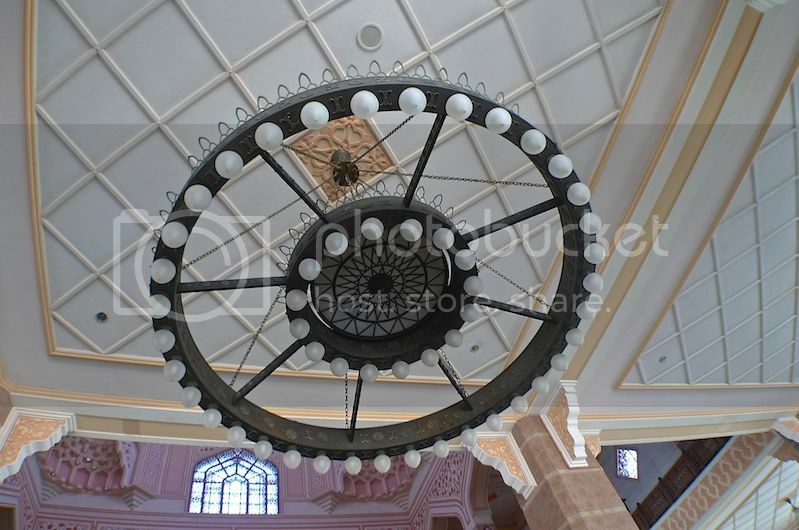 The 36-metre diameter dome is just right on top of the prayer hall with 12 huge columns supporting it. The highest point below the dome is 250 feet above ground level. Don't you agree it looks so beautiful? 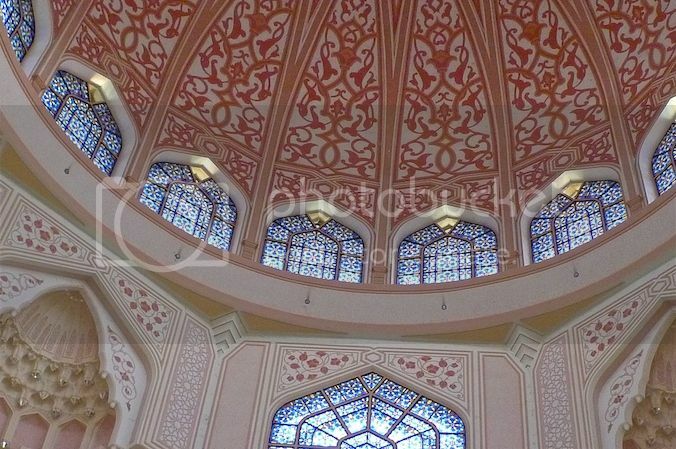 The Prayer Hall itself is elegant with intricate designs on the walls. 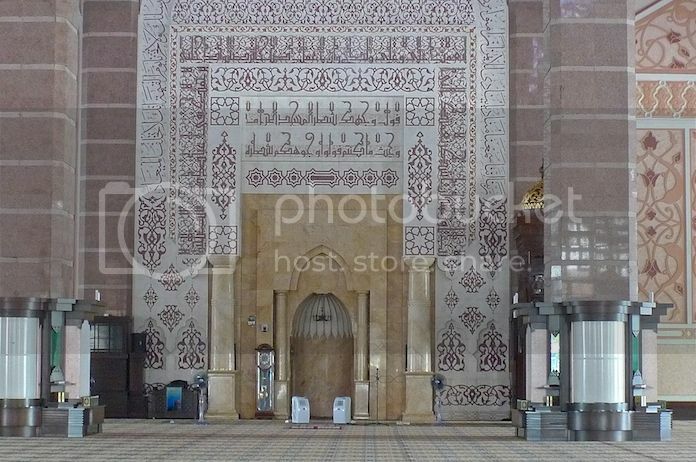 The Mehrab (niche or indentation in the wall indicating direction of qiblat in Mecca) are adorned with Islamic calligraphy. The view from inside the mosque looking out. 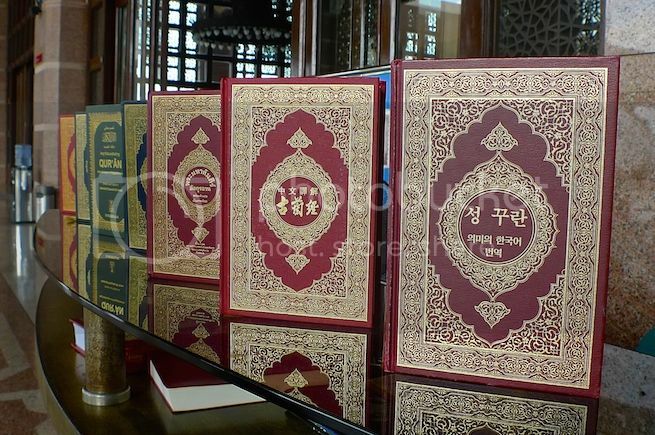 On display were The Holy book Quran in different languages. So many Quran books lining on the table! Do you recognise the languages? 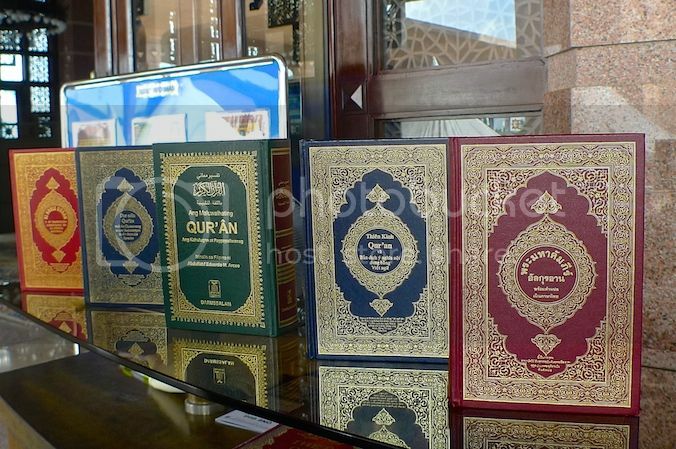 It is said that the Quran is the only book in the world with no revised editions - meaning not a word in the Quran had been added, removed or altered. 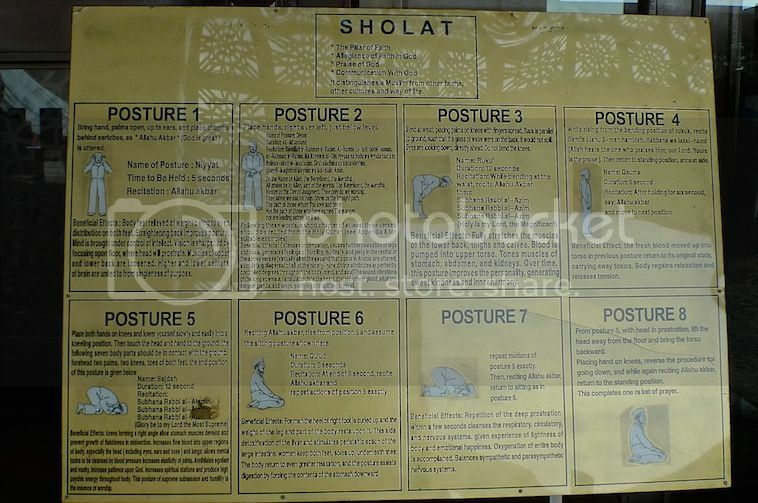 A poster depicting the different postures while doing the sholat or prayer. 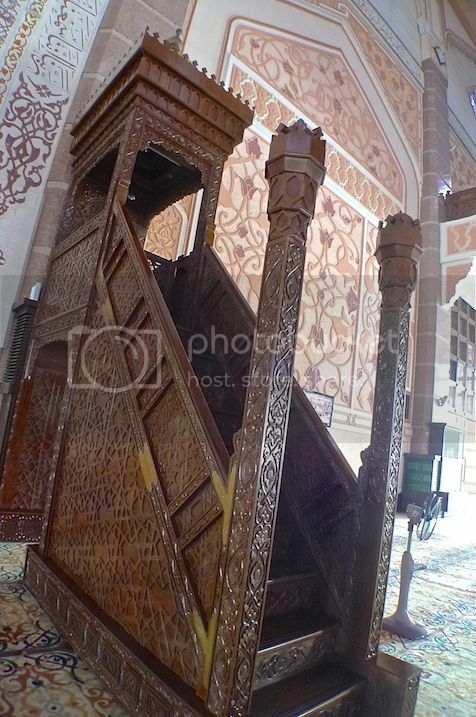 This wooden structure is the Minbar or Pulpit. It has a short staircase leading to the top platform. 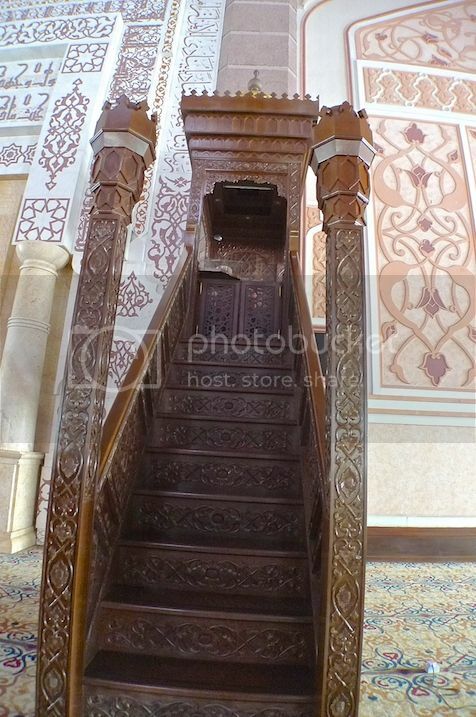 The Minbar is used by the Imam, who leads the worshippers in prayers. 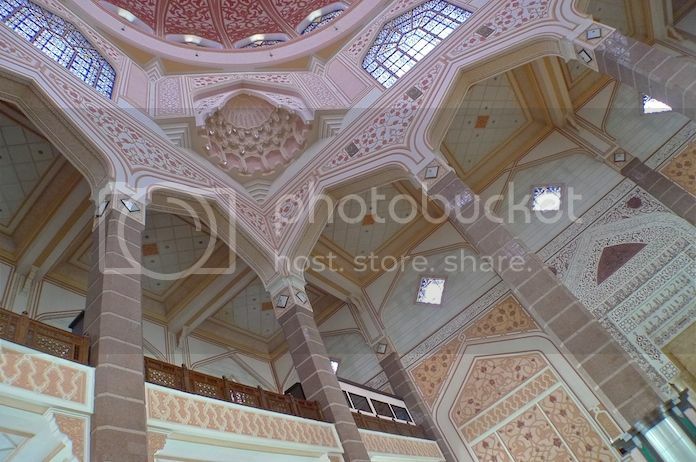 He usually gives sermon before the Friday prayers at this Minbar. Our friendly guide explained to us about Islam and showed us the genealogy of the 25 prophets mentioned in the Quran. 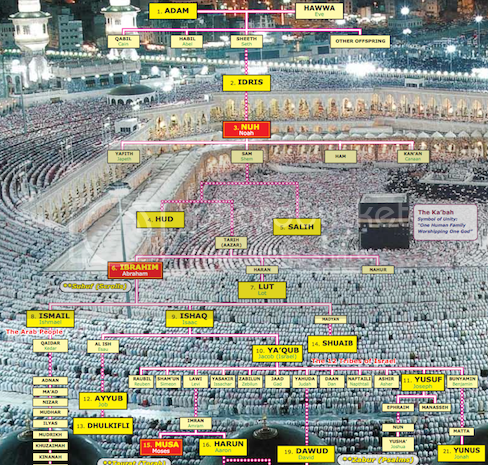 From the chart, you can see how Islam and Christianity are closely related. The above is just a screenshot of the genealogy chart. For the full image, click HERE. 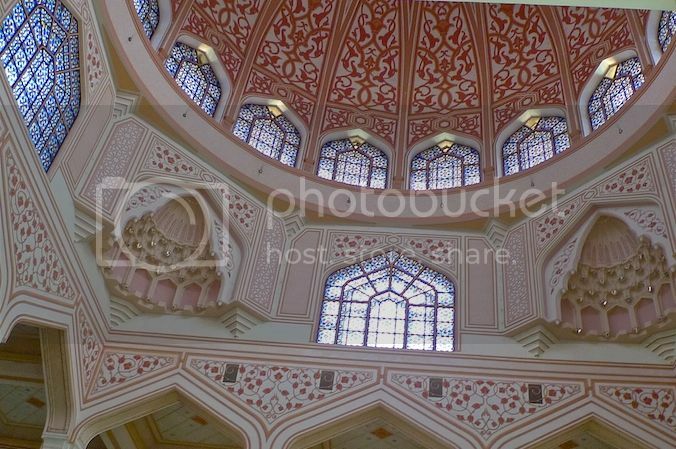 I took a few more shots of the interior before stepping out of the mosque. Although our guide explained and enlightened us about Islam, he did not make us feel uncomfortable or tried to convert us. I am sure my Filipino friend who is a Christian felt good talking to him. 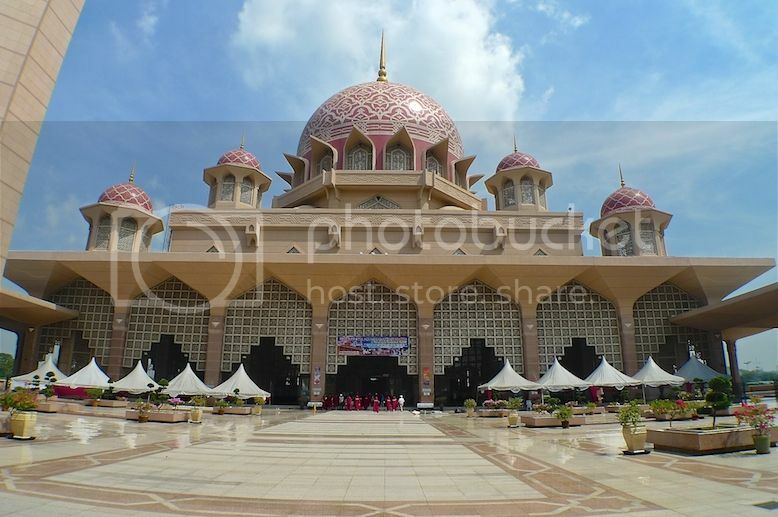 The Putra Mosque is large enough to accommodate a maximum of 10,000 worshippers. 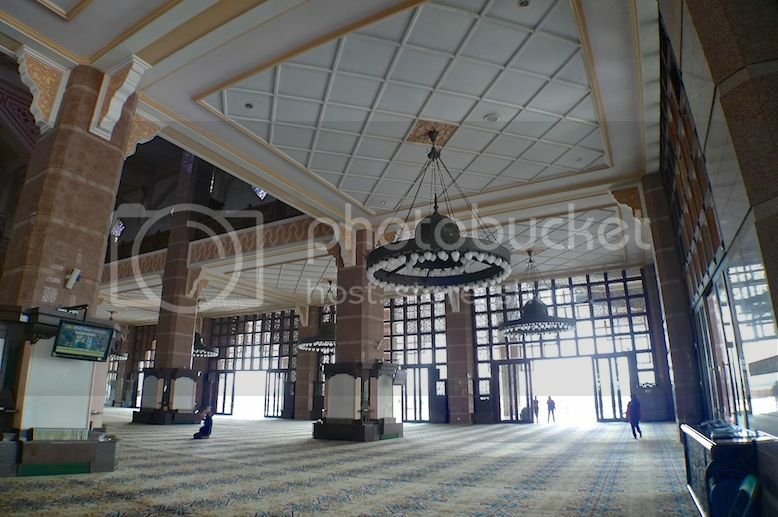 Outside the prayer hall is a spacious area next to the fountains. This area could probably hold another few thousands worshippers. 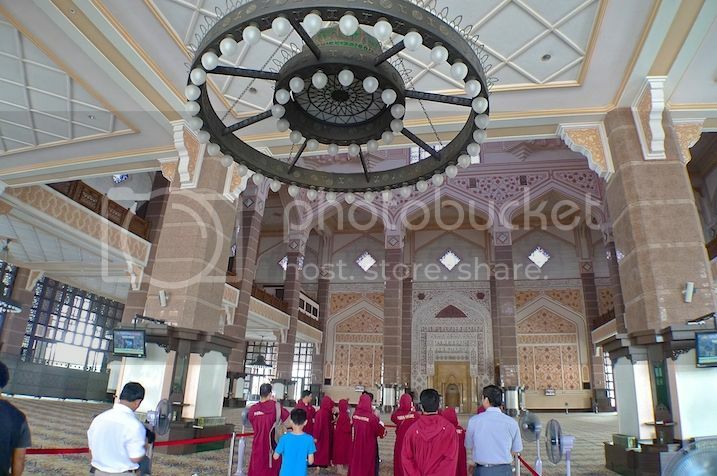 It was a good experience visiting Putra Mosque. I was glad I did it! 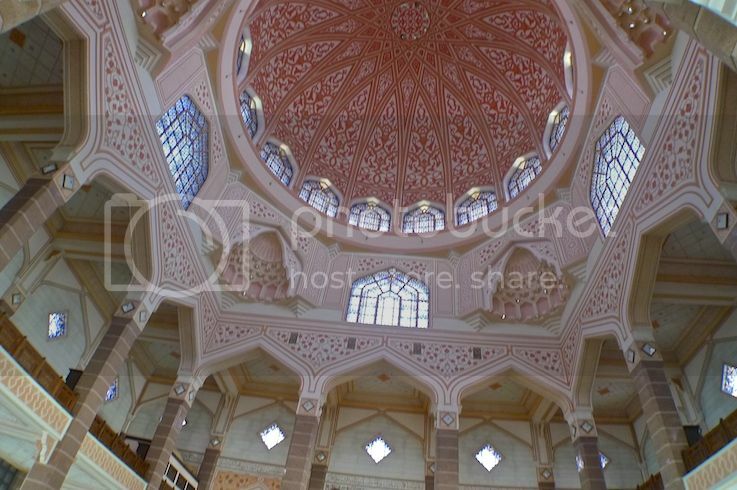 But there was another mosque in Putrajaya that we wanted to visit. It's located nearby and curiously called The Iron Mosque. That will be in another post, so stay tuned.